Learn2Analyze follows six interrelated action lines to achieve its project objectives. The action lines are clustered into the following six work packages (WPs). WP1 (Project Management) is an overarching project-wide activity related to the definition of all contractual, administrative, financial, management and communicative procedures of the project. WP2 (State-of-the-art Environment Scan and EQF Definition for Instructional Designers and e-Trainers) works on the development and validation of two professional competence profiles, for instructional designers and for e-Trainers of online courses, mapped to the European Qualification Framework (EQF). WP3 (Learn2Analyze MOOC Design, Development and Delivery) builds on the outputs of WP2 and works on the design and development of a novel, gamified professional development MOOC for cultivating these competence profiles. 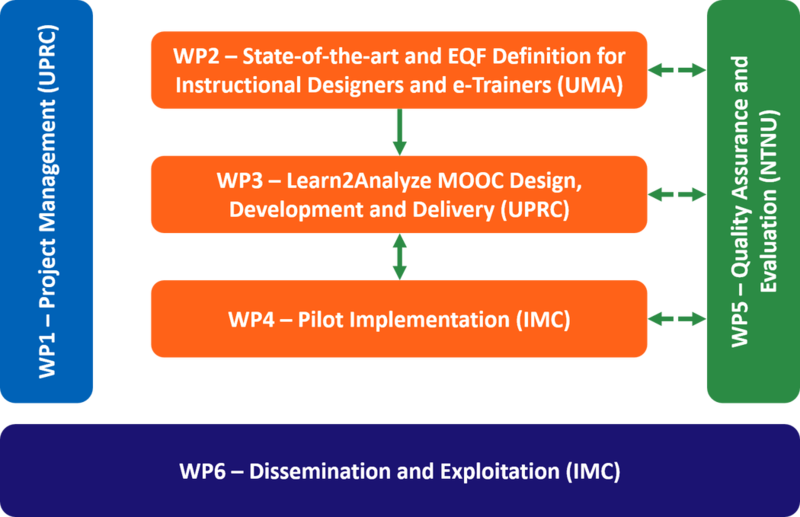 WP4 (Pilot Implementation) will evaluate the MOOC, through two pilot phases (phases A and B). Both phases will adhere to an implementation plan. The evaluation insights (WP5) from Pilot phase A will potentially lead to reflective revisions of the MOOC Design, prior to the Pilot phase B.
WP5 (Quality Assurance and Evaluation) is an overarching project-wide activity related to (a) the definition of transparent procedures for ensuring the quality control of the project and each of its outputs and (b) the definition of the MOOC Evaluation Plan, i.e. the methods, instruments, and analysis approaches for evaluating the MOOC during both pilot phases. WP6 (Dissemination and Exploitation) spans the full project lifetime and is related to the design/implementation of a Dissemination and Exploitation Plan, in order to (a) inform external stakeholders on the project outputs, to create global visibility and (b) pave the way for sustained take-up of project outputs after the end of the project.